Table lamp for diffused lighting. The diffuser is made up of an opal polypropylene plate held by a white polyester microfibre washable envelope with transparent plexiglass supports. Includes 78.75" cord. Available in two sizes. 21T (small)-20.8"L X 5.2"W X 12.25"H. Uses 1 X 40W 120V E12 (candelabra base) G16.5 incandescent lamp (not included). 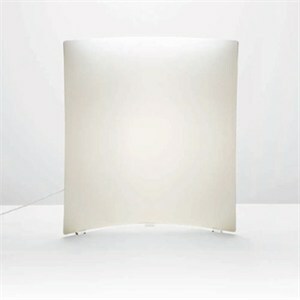 22T (large)- 20.8"L X 5.2"W X 24"H. Uses 1 X 60W 120V E12 (candelabra base) G16.5 incandescent lamp (not included).